With so many new distilleries currently popping up across Scotland, I often think how they’ll establish a reputation for themselves against the big brands, many of which have over two centuries of history and heritage to tap into. But my recent visit to Arran Distillery proves that there’s plenty of interest in new, start-up whisky brands. Located in Lochranza at the top end of the island, Arran Distillery only opened its doors in 1995. Although the island used to have up to 50 distilleries, most of these were illegal, with the last legal distillery closing in 1837. The new venture was the brainchild of former Chivas director, Harold Currie, who designed the building with the intention of giving it a much more traditional, classic appearance. Everything takes place in one room, including milling, mashing, fermentation and distillation, which means the whole operation can be run by just one person. Barley comes from the east coast of Scotland, with no peat used in the malting process, with post-maturation processes taking place in Stirlingshire. A recent refurbishment saw the stills replaced for the very first time, after 21 years of service. Another two stills were added, bringing the total to four, although more wash-backs need to be added before additional production can be fully realised. 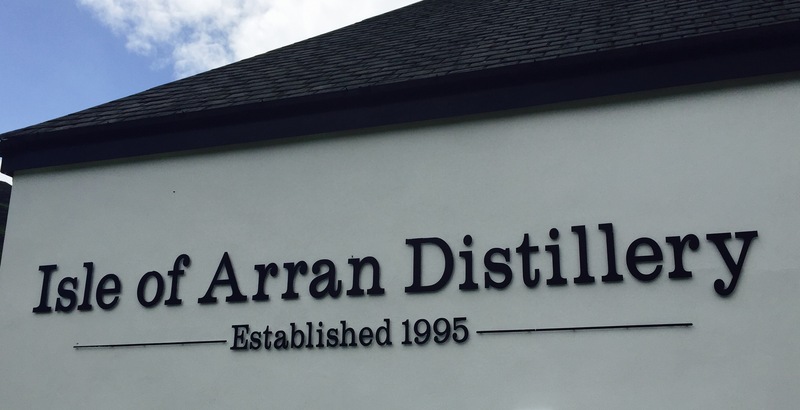 Arran Distillery produces around 500,000 bottles a year – a great figure to reach after just 20 years in operation. The core range comprises at 10, 14 and 18 year old, but they’re not scared to experiment, with a whole range of ages and finishes on offer. A certain amount of the annual production goes into The Robert Burns Blend and the Lochranza Blended Whisky, along with the moreish Arran Gold Cream Liqueur. Around eight years ago, the distillery also started experimenting with peated barley, which is released under the Machrie Moor brand. However, from 2018, the production of this will shift to a new distillery at Lagg, in the south-west of the island. The tour was fantastic value. For £8, you get a full-guided, 45 minute tour, which is finished off with a sample of the Arran 14 Year Old and the Arran Gold Cream Liqueur. An extended tasting of the Arran range costs £15.50, although a joint ticket for both costs just £20. And you’ll find out what I thought about the whiskies later in the week. You can find out more about Arran Distillery, its whiskies and tour over on the distillery’s website – www.arranwhisky.com.